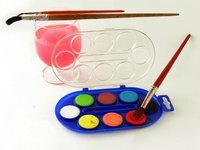 Painted plastic panels make distinctive sun catchers and other decorative additions to any home or garden. It’s simple to paint plastic for light to shine through if you use the right type of paint. Create a decorative panel to hang in a window or to stand in front of a bare light bulb with an acrylic sheet and stained glass paint. Paint a plastic soda bottle hummingbird feeder red to hang in the garden. Translucent glass paint will allow the light to shine through the feeder so you’ll know when it needs a refill. Clean both sides of the plastic panel with glass cleaner. Place the plastic panel on top of the design template. The design can be anything at all that you’d like to trace and paint onto the plastic panel. When the light shines through the translucent image, the paint colors will come alive. Clean the side of the panel facing up with rubbing alcohol to remove any fingerprints. Be careful not to touch this side of the panel again with your bare hands. Wear cotton gloves as you complete the project to avoid transferring any oils and prints from your hands to the plastic panel. Trace the outline of the design onto the plastic panel with glass paint pens. Glass paint pens are as translucent as glass paints. If you prefer a stained glass style image, trace the outlines with liquid leading. Fill in the spaces between the outlines with glass paint to recreate the image. Apply glass paints with an artist’s brush, the same way you would apply acrylic paints. For a stained glass effect, squirt stained glass paints between the dried liquid leading lines. An artist’s brush is not necessary to apply stained glass paints. Allow the paint to dry completely. Glass paints may be baked onto glass, but it’s best to place plastic panels to dry in direct sunlight. The heat from the sun will bake the paint onto the plastic panel. Prop the painted plastic panel in a window to let the sunlight shine through. Stand the panel upright in front of a candle holder to let the candle light shine through. Paint several plastic panels and hang them around a single light bulb. Make sure to use a drill bit approved for drilling plastic to make holes to hang the panels.